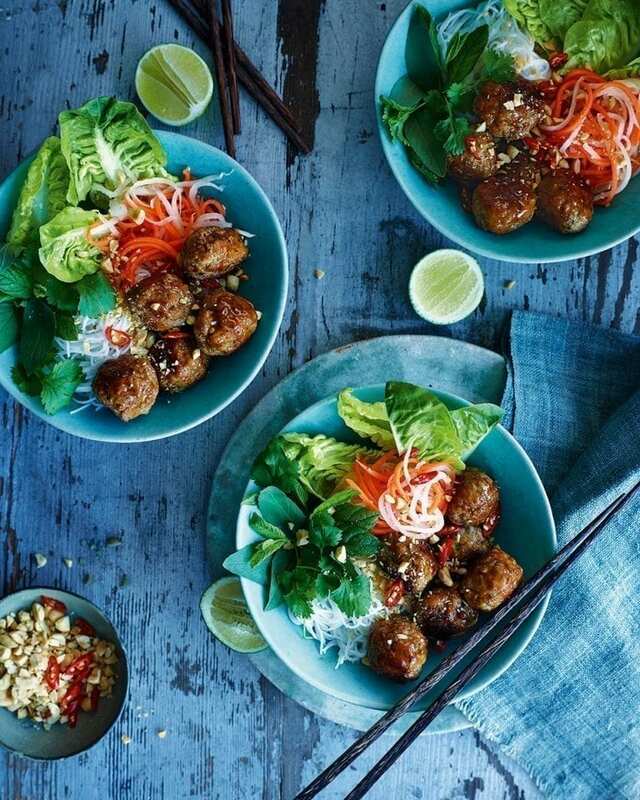 Lemongrass, garlic and lime all contribute to the powerful flavour of this Vietnamese meatball recipe. For the quick-pickled veg, put the fish sauce, vinegar, sugar, lime juice, water and sea salt in a bowl. Stir to dissolve the sugar. Transfer half to a mixing bowl (reserve the rest), then add the veg. Toss to coat, then set aside (toss now and then). For the meatballs, combine all the ingredients except the oil in a bowl and mix well. Roll into 20-24 walnut- size meatballs, then set aside. For the glaze, mix the honey, soy, fish sauce and lime zest in a bowl. Heat the oven to its lowest setting. Heat a large frying pan with a glug of oil, then fry the meatballs over a medium heat, turning occasionally, for around 8 minutes until cooked. Put the meatballs in a small roasting tin, drizzle over the glaze, toss to coat, then put in the oven, covered loosely in foil, to keep warm. Drain and squeeze dry the pickled veg, then put in a bowl. Divide the noodles among serving bowls, pour over the reserved pickling liquid, then spoon in the meatballs and a drizzle of glaze from the tin. Top with a tangle of pickled veg, then scatter over generous amounts of herbs, peanuts and chillies. Serve with lime wedges, if you like. Make the meatballs up to￼ 48 hours in advance, without frying, then chill, covered. Or freeze on trays, then bag up and store in the freezer for up to 1 month. Defrost before continuing. Make the pickling liquid up to 48 hours in advance and keep chilled. The pickled veg can be made 4-6 hours ahead; keep in an airtight container. Make the glaze up to 24 hours ahead; keep covered somewhere cool. Our friends at Majestic Wine recommend Valpolicella Classico Cantina di Negrar. The key to the best Valpolicella is intense fruit and a beguiling freshness. This has both in spades, which means it’ll stand up against the meatballs without clashing with spice.